Born and raised in South Africa, Evan's marketing chops were developed within the music industry, having worked on the grass roots marketing campaigns for both major and independent record labels. 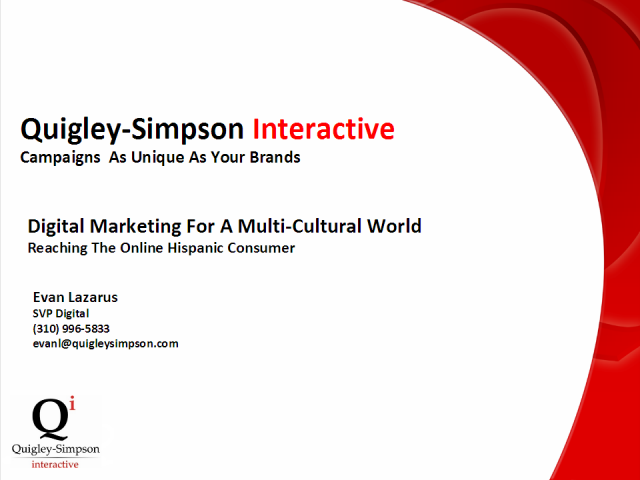 In 2008, he joined Quigley-Simpson as SVP Interactive, where he develops and manages online and mobile initiatives for their client base with a focus on multi-cultural digital marketing. Presented by Michael Adler, Managing Partner at AC Lion as well as Josh Marmer, Executive Recruiter at AC Lion. Learn about all of the necessary strategies and techniques that go into finding the right job as well as securing the right job in Online Media. This includes Resume Building, Interview Tips, and Job searching strategies. Integration is not a four-letter word! An overview of how marketers and agencies can successfully integrate digital into their marketing plans without breaking the bank. Presented by Jennifer Samples, SVP, Director of Digital Marketing at Targetcast. Jen developed a 4E's methodology that measures Exposure, Engagement, Experience, and Efficiency in response to her client's needs to integrate awareness with actionable metrics. Learn all about online lead generation from Harvard Business School graduate, Gary Kreissman, current President of Precision Prospects with over 20 years experience in marketing and business development, with particular expertise in direct marketing, financial marketing and interactive media. Webcast series on a number of different topics ranging from Social Media, Mobile, Location Based Advertising, Behavioral Targeting, Finding the right job in Online Media, etc. Webcast presenters range from CEO's, VP's at major Interactive Agencies, and big online marketing guru's.